A nattily-dressed crowd was on hand for the red carpet opening last month of the new pilot restaurant from Top Chef’s Spike Mendelsohn, including top-four contestants Lisa Fernandes, Stephanie Izard and Antonia Lofaso. Handed out to the attendees were samples of what the restaurant offers, including the Good Stuff Melt, the Vegetarians Are People Too ‘Shroom Burger, Sunny’s Handcut Fries, and homemade shakes. 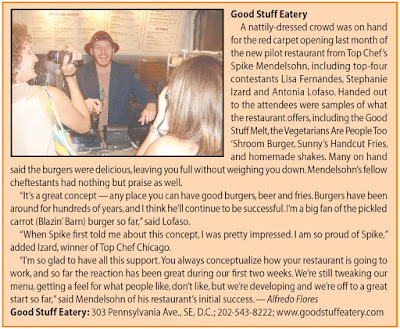 Many on hand said the burgers were delicious, leaving you full without weighing you down. Mendelsohn’s fellow cheftestants had nothing but praise as well. “It’s a great concept — any place you can have good burgers, beer and fries. Burgers have been around for hundreds of years, and I think he’ll continue to be successful. I’m a big fan of the pickled carrot (Blazin’ Barn) burger so far,” said Lofaso. “When Spike first told me about this concept, I was pretty impressed. I am so proud of Spike,” added Izard, winner of Top Chef Chicago. “I’m so glad to have all this support. You always conceptualize how your restaurant is going to work, and so far the reaction has been great during our first two weeks. We’re still tweaking our menu, getting a feel for what people like, don’t like, but we’re developing and we’re off to a great start so far,” said Mendelsohn of his restaurant’s initial success.